Let's have a quick break from the E3 trailers, and instead take a look at the new Overwatch video. This time, Blizzard is highlighting Winston. 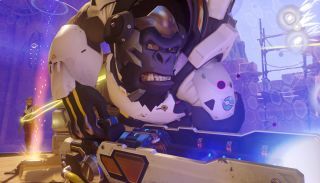 As a smart-talking, fist-pounding tank, he's Overwatch's equivalent of Beast—only a big purple ape, not a big blue cat-ape. Winston can take a lot of punishment, and can protect allies through a deployable bubble shield. His gun fires out short-range electrical static, and his jump pack allows him to leap through the air. Then there's that ultimate, called Primal Rage, which overcharges his health and boosts his abilities. They should have called it Beast Mode.